Do you love paper chains as much as I do? When I was little my mom would get me these little packs of paper strips that already had the glue on the backs and you just licked them to make the chains. Pure delight to this young crafter in the making! These paper chains that I made for printing aren't exactly lickable, but they do have yummy treats on them! I chose a few of my favorite Cookies for Santa, and added them to stripey strips. By placing plain white strips between the Cookies for Santa links, you can be sure to see the Cookies facing the right way. That may be silly, but it's important to me when I make things like this. 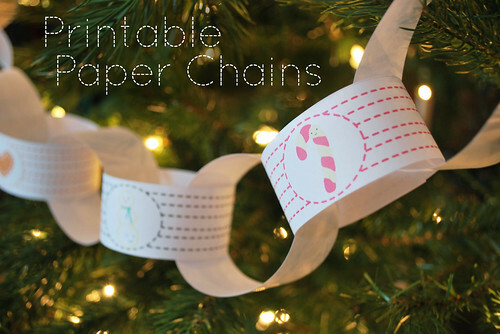 Anywho, download the printable paper chains, then print and link some fun! Oh, and for a chance to win some printable Cookies for Santa ornament tags, hop over to my Facebook page. I'm giving away a bunch of sets that would look nice with your paper chains! I´m always totally impressed by your creativity! Have a very merry x-mas! Can't wait to do this today! !